Both Introduction to Robotics Engineering and Robotics Engineering are courses available to 10th-12th grade students at Davis Senior High School or DaVinci High School. The course descriptions for both robotics classes are listed below. This is an introductory course designed to give students an overview of many aspects of engineering as applied to robotics applications. The emphasis of this course is to provide students with a fun, hands-on experience where they will work in small teams to design, build and program their own robot. Teams will be given several design challenges and, ultimately, participate in a competition to test the worthiness of their design. During the design and fabrication process, students will test and evaluate their robot, all the while learning important life skills and engineering concepts. Topics will include workspace safety, teamwork and organization, engineering process, mechanical design/CAD, mechanical fabrication, electronics, programming, pneumatics, media, and competition strategy. This course is designed for students who have already completed the “Introduction to Robotics Engineering” course. The course will follow the same format as the introductory course but topics will be taken to a higher level and more emphasis will be put on Mechanical Design. The main focus of the course will be designing and building a robot to compete in the most recent VEX Robotics Competition. Students will learn to use Solidworks CAD design software and then use 3-D printers to manufacture components based on their designs. Additional topics covered will include workspace safety, teamwork and organization, engineering process, electronics, programming, pneumatics, media, and competition strategy. 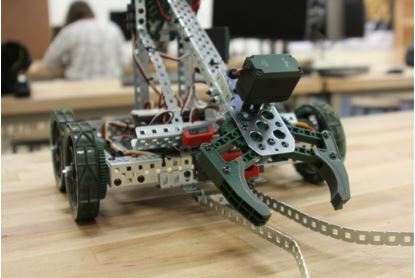 This course is designed to allow students to pursue their interests in a variety of areas related to robotics while participating in a nationally recognized robotics program, FIRST Robotics. Students taking this class will be required to participate on the Citrus Circuits robotics team. Students will choose their area of interest from the following: mechanical design/CAD, mechanical fabrication/assembly, electronics, programming, or business/media. Although there will be some academic topics such as mechanics, electronics and programming, the course is mostly project-based and will require a significant amount of work outside of the regular class period. The main focus of the course will be the design, fabrication, assembly, and programming of a competition robot. However, students interested in the business/media strand will focus on support of the team through business development (fundraising, sponsorship, financial management, etc.) and team image (press releases, social media, website development, team apparel, etc.) More information about the FIRST Robotics program can be found at www.usfirst.org/roboticsprograms/frc.